Imagine my surprise when I read this in today's Wall Street Journal: "Akili Interactive Labs Inc. of Boston, formed by start-up-creating firm PureTech Ventures, and San Francisco company Brain Plasticity Inc. are seeking Food and Drug Administration approval for a video game treatment they hope clinicians will turn to before prescribing medicines for ADHD" (read the story here). I've been writing a lot about "gamification" and the pharma industry (see "Pharma & Fun, Not Oxymoronic? Here Comes Gamification!" 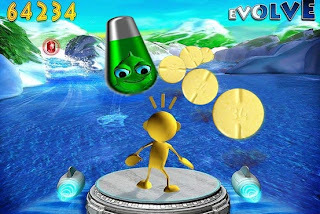 and "Gamification, Then and Now", for example), but never from the perspective of games designed to compete with drugs such as Novartis' Ritalin, a stimulate indicated for the treatment of ADHD. Akili -- meaning "wisdom" in Swahili -- is the name of the video game that Akili Interactive Labs hopes will be the first ever video game "treatment" approved by the FDA. The game is designed to run on smartphones and iPads. The company also hopes clinicians will recommend the game to patients before prescribing medicines for ADHD. First, fat chance that the FDA will actually approve a video game as an effective treatment for a medical condition. Second, fat chance that even if approved, health insurers/patients will pay for a game treatment after being conditioned all these years to think only of drugs as treatments. Third, fat chance that physicians will prescribe the game to their patients. That would require overturning the entire drug-physician industrial complex! Nevertheless, Akili co-founder Eddie Martucci said "his company's research shows that people want choices other than today's powerful medicines. 'We would aim to have efficacy and tolerability that outstrips any of the drugs.'" Wow! Are these guys anti-drug industry? NOPE! Senior Partner, Chairman of PureTech Ventures is Dr. Ben Shapiro who was previously Executive Vice President, Worldwide Licensing and External Research for Merck. Another Senior Partner at PureTech is Dr. John LaMattina, who was previously President, Pfizer Global Research and Development and Senior Vice President, at Pfizer Inc.
LaMattina, who also writes the Drug Truths Blog at Forbes, was once enthusiastic about torcetrapib, a drug that Pfizer hoped would replace LIPITOR. "We believe this is the most important new development in cardiovascular medicine in years," said LaMittina. That was before Pfizer halted development of torcetrapib and after it spent more than $800 million on its development (read "torcetrapib: $800 Million Failure but Kindler Safe"). Hopefully, Akili isn't costing nearly as much to develop as a new drug. With such experienced drug industry veterans as partners, Akili might have a chance of making it to the FDA. Unless, of course, clinical trials reveal dangerous side effects. It's not likely such side effects will be similar to those that torcetrapib caused; i.e., death. Some video game critics, however, fear that "electronic media might improve visual attention but impair the ability to sustain attention on a hard or boring task," notes the WSJ article. "The latter type is what teachers need from students, according to ... Douglas A. Gentile, a developmental psychologist at Iowa State University." What teachers DON'T need, however, is for students to claim that playing video games during school is part of their medical treatment! It's interesting to speculate how FDA-approved video games would be marketed, assuming any will actually be approved by the FDA. Akili, for example, might splurge on exhibits at medical meetings and lure physicians into its booth to play the game. And maybe it would hire physicians to be "consultants" and "speakers" to promote the game to their peers. I'm betting that direct-to-consumer (DTC) TV ads would be out of the question -- much too expensive for a product unlikely to reach "blockbuster" levels of sales. I do, however, envision that DTC social media could be very cost-effective for marketing FDA-approved video game treatments.